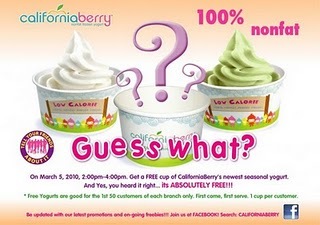 So visit any Californiaberry Branch on March 5 2010 (Friday) from 2 to 4 pm and experience one of the best things in life. FREE! Free frozen yogurt for the first 50 customers! « Karate Kid 2010. Hiyaaaaah!